It's another Mystery Prize Week at Casumo Casino! They are giving away 20,000 in cash to over a hundred gamblers who play on these 4 specific slots. So how does this cash drop work? Well, it’s easy enough. You’ve just got to play on four very specific gambling mobile games. This £€20K isn’t part of the wins in the slots, they stand apart. 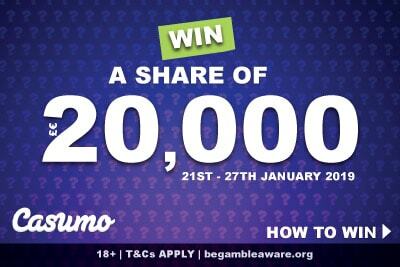 Casumo will randomly drop from £€10 to £€5,000 into your account, as you play this week, win or lose. We take a look at whether the video slots are worth playing, which is better than all the rest, and how easy it would be to win. This is the point where we are supposed to tell you how you win these Casumo Mystery Prizes. But we kinda already did. This isn’t very complicated. 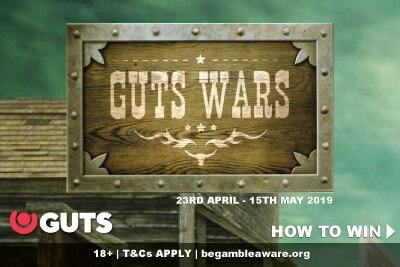 Anyone who takes one spin on games below will have a chance to win a real cash prize. There are over a hundred cash prizes up for grabs, and anyone can win with just a single spin. The cash prizes can drop at any point this week, from the 21st to the 27th of January, so anytime you open your account you may see a little extra cash. As this is so simple, we will focus on what important: the four games and whether they are worth taking a spin or two. Well, we are going to go on record and say that if you are going to play one Play’n GO classic slot this week, make it Fire Joker. It’s not complicated, but the entire fun is based around the stacked symbols. Not a crazy feature, but all the other features revolved around it. So if you get two reels with the same stacked symbols, the third reel will re-spin. And if you get 3 reels with the same symbol, then you get a multiplier of 2x to 10x your bet. It reflects this Casumo cash drop perfectly: simple, easy to understand, and cash rich. This is a brand new game by Play’n GO and the only 5 reel slot game in this list. So if you don’t like classic slots, then this is the one to play. The Star Joker slot is heavily marketed as a real money game for beginners, mostly because when you first load the game you get full instructions on how to play online slots. This is useful and certainly helpful. But that doesn’t mean it’s not fun for everyone if you are experienced enough to skip the instructions. It’s a fun low variance 10 payline slot where you can still win up to 5,000 times your bet. Trust us, it’s a good spin. But actually, this little joker gem is when Play’n GO got the concept right. With prettier, sharper graphics, this fruit slot machine with a Supermeter is exactly what you expect. 5 paylines, lots of joker wilds, and every win can be gambled back for even bigger wins. Not for those with weak constitutions. So out of the lot, this Mystery Joker classic fruity is the one we like the least. In many ways, it’s very similar to the 6,000 version. Except it looks old and dated, and of all of them, it’s probably the most ‘standard’? Which walks very closely with ‘boring’. 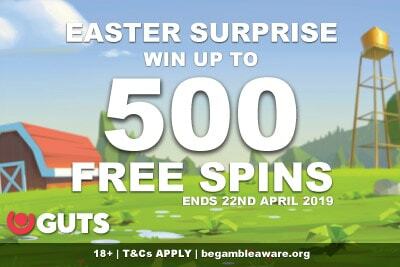 However, there’s no supermeter, no multipliers, just free spins and some mystery wins. It’s a very ok 3 reels 5 paylines with bells, bars, cherries and melons. You can give it a spin with a minimum bet of only 0.10 a spin, so it’s not a huge gamble. But, honestly, you have 3 other much better and much more interesting games to try out. Want even more than that slice of £€20,000? Well, good news! 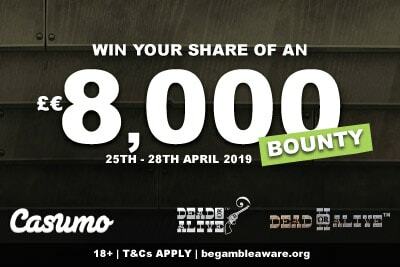 at 8pm (CET) on Monday, Tuesday and Wednesday, you can win an additional £€2,000. How? By playing on the Casumo casino Reel Races. These are slot tournaments, where you spin on certain games, and every win will give you points. You only have a certain number of spins to get as many points as you, but then so does everyone else. So it’s totally fair, and it doesn’t matter how much you are betting. What are the Casumo casino top Reel Races this week? We should point out that most of the Reel Races prizes are free spins. Once a day, at 8PM (CET) they run their Grand Reel Race where you can win cash – usually, it’s £€1,000. Not on the dates above. On those, it’s a £€2,000 top prize, and every spin you take gives you a chance to win a slice of that £€20,000. It’s a great opportunity to experience one of the best casino slot tournaments around, and two chances to win extra cash. Because none of these are the wins held in the game; that’s on top of all these Casumo casino giveaways. Try them today, get a generous bonus to try them out, and you’ll soon find a new favourite gambling site.